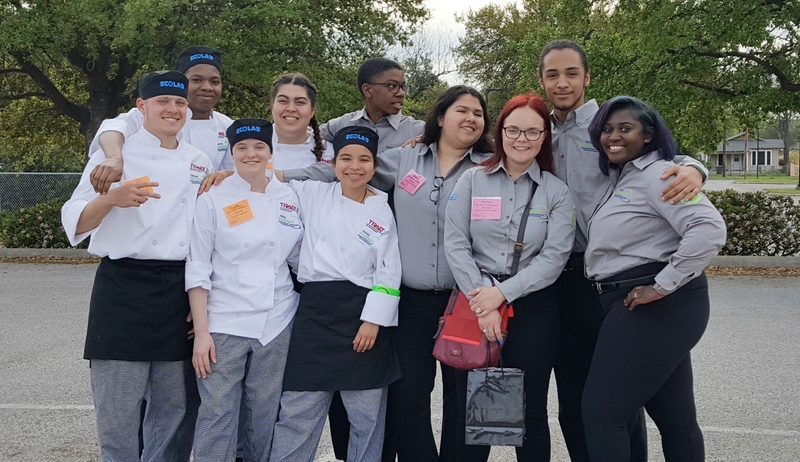 Students in Ben Barber Innovation Academy’s culinary program ended their competition season knowing their culinary and restaurant management skills are among the top three in the state. The high schoolers competed at the Texas State ProStart Invitational in San Antonio. The restaurant management team came in second place. Members of the culinary team finished in third place. ProStart is a nationally recognized program that prepares students for careers in the restaurant and food service industry. Thousands of students from more than 240 high schools participate in the program each year. Competitions are very rigorous with a focus on real-world implementation. For the state contest, the culinary team was tasked with creating menu books and preparing a three-course meal in one hour using no electricity. Restaurant management students had to come up with a restaurant concept, create a marketing program and present their ideas to a panel of industry professionals. Texas is one of the most competitive ProStart regions. Chef David Roberson said his teams barely missed qualifying for the nationals, but they still accomplished what few schools have ever done. "We placed two teams in the top three in both divisions this year," the culinary teacher explained. "We were also told by the lead judge that our team spirit was the most enthusiastic he has ever seen in the last 12 years. This year set the foundation for years to come." The ProStart contestants are given a certificate of achievement. Some are also awarded scholarship money depending on where their team places.